Attention Truckee CA residents – this development is less than 30 minutes away from Truckee and NV has no income tax – so, consider this area for your next home or retirement home. There are many Truckee residents that are planning to purchase one of these homes. The pictures below have pricing and lot numbers for existing “Estates” homes for sale. D.R. Horton has their own finance company and will offer a discount if you finance through them. If you are interested in seeing the Falls, Crest or Estates models please let me know and I’ll set up a visit for you. If you happen to stop by the sales office without me please inform Ryan Flynn, the sales manager, that you found the information about The Estates at West Meadows on my website. Great video from the CA Highway Patrol about why Highway 80 is closed today (2/15/2019}. Truckee is certainly a family friendly all season recreation area for singles and families who love outdoor activities. I’m not sure about the friendly but off the radar comment since things are busy up here during the ski and summer seasons. Curious about the pricing and availability of homes in Truckee and Tahoe Donner? Drop me an email and I’ll send you some information. 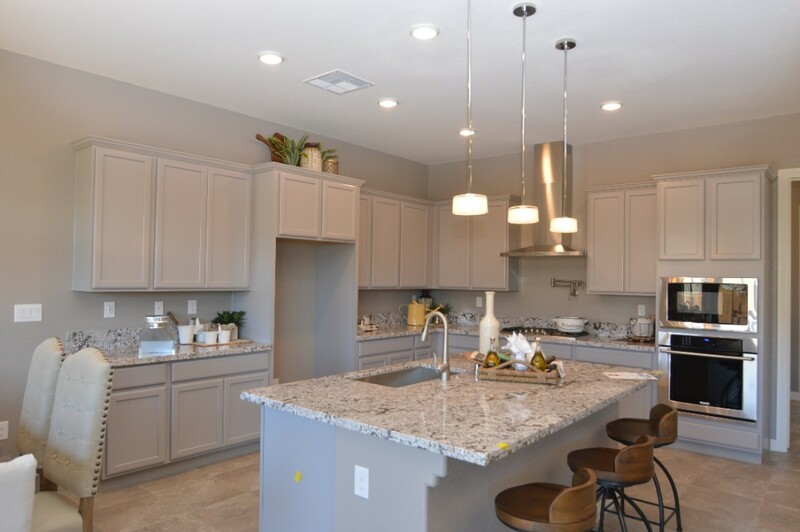 Located in the scenic Verdi area, Crest Models at West Meadows offers home buyers their choice of 4 spacious floor plans from 2,451 to 2,851 square feet and feature up to 4 bedrooms and 4 bathrooms and 2 or 3 car garages. Enjoy the outdoors via magnificent nature trails and parks, as well as biking and hiking opportunities only minutes from your front door. Enjoy a relaxing afternoon exploring one of many trails, dog parks, or nearby restaurants. And, it’s a short, less than 30 minutes commute to Truckee from the Verdi location and no state income taxes. With D.R. Horton’s simple buying process and ten year limited warranty, there’s no reason to not find yourself home at Crest at West Meadows. Contact me to arrange a tour of the models and the area. 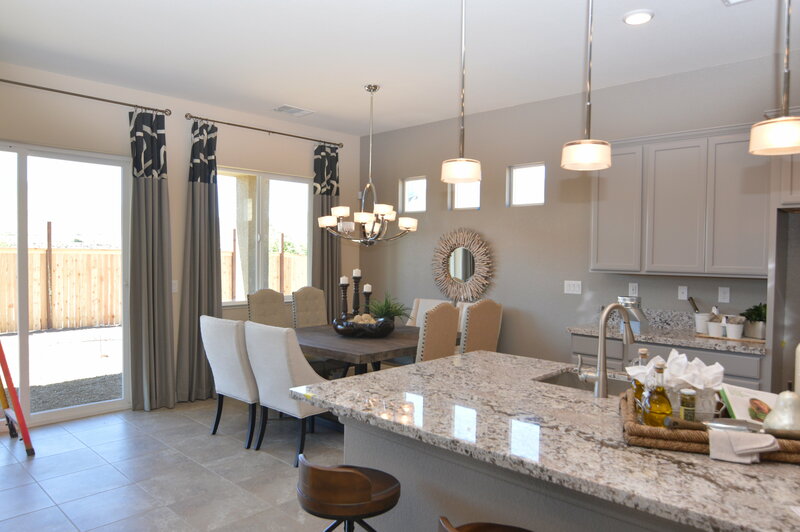 The 4 single story West Meadows Estates model homes in Verdi are opening this coming weekend on June 30th. I will be available to visit the models with you if you can let me know when you want to preview the homes. 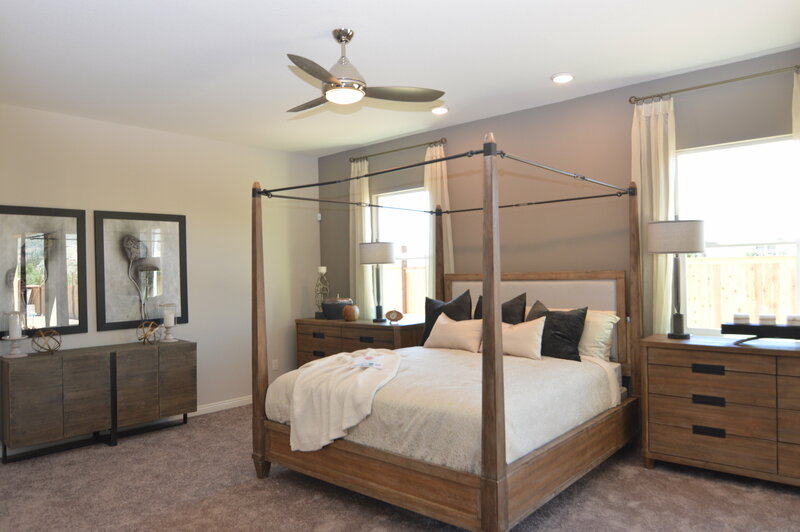 The model homes will be completed and furnished so you can see the finished look for these beautiful homes. I toured the models a couple days ago and added a few preview pictures below. The Estates Homes come in three different design levels – Emerald is the first level, Ruby is the second and Diamond is the third level. The trim options affect countertops, cabinets, baseboard sizes, doors, etc. Great place to move to for a lower cost home less than 1/2 hr to Truckee and no State Income Tax and a lot less snow. You may notice a small piece of duct metal and a couple of yellow stickers on the kitchen counter that indicate where some touch up is required. Same kitchen from a different angle. The next picture shows lot 208 being trenched and prepared for utilities below the concrete slab that will be poured for the foundation of the home. Note the grey fine grained material that will be placed around the sewer pipes, water pipes and electrical pipes to protect the underground utility lines. The following picture illustrates the “build plan:” for the Estates single family homes. The numbers in the circles denote groups of typically 4 homes that will be built at a time. They have started 22 planned homes or a little over 5 groups (lots 180-183). Planned in this case means that D.R. Horton has selected the lots and model of homes that will be built in these groups. They would like to sell the 22 homes by the end of Sept although this may slip into Oct. Buyers who want a different home or lot location other than these 22 homes will pick a lot and home style in groups 6-10 for completion in 2018. Then buyers will move up from groups 6-10 to groups 11 to maybe 20 for 2019 and so on. Build plan for the Crest 2 Story Models – three 2 Story Models are being constructed across the street from the 4 single story Estates Models and the rest will be inside the dotted lines. The build plan for the 58 Crest Homes is not defined yet. The Falls 2 story homes are on the East side of the development (right side of the above picture) and appears to be planned before the Crest models. I would expect the Falls foundations to be started soon. I would like to assist you in sorting out your options for purchasing one of these homes and would like to accompany you on your first visit to the sales office – which will move from the sales trailer to the garage of the first model home this coming weekend. Feel free to contact me if you have any questions about the single or two story homes or wish to view the model homes with me. The Estates at West Meadows has several two story model homes going up now. Pictures of models plus floor plans are shown below. Like the single story, pricing is not available yet but is expected soon. 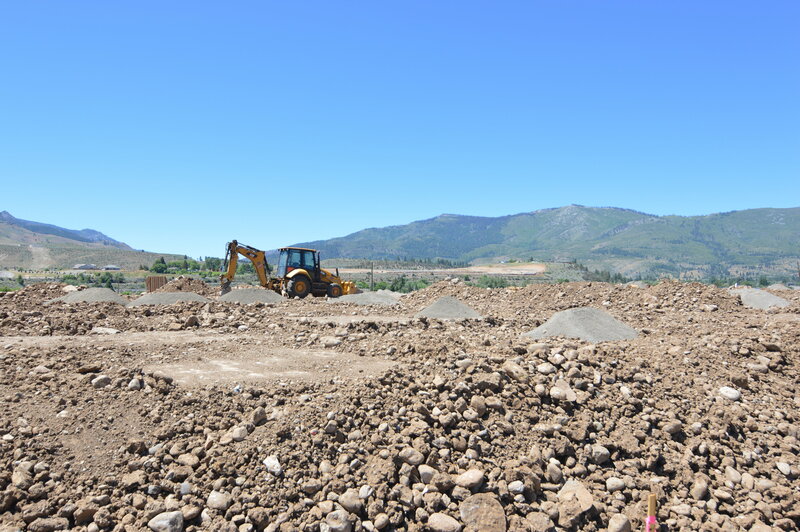 Located by the Truckee River In Verdi the development of 324 homes will include a mix of mostly single story homes as well as 2 story homes. The developers will add a small park with a children’s play area and a commercial area that will include some stores that are not defined yet. D.R. Horton has published pricing single and two story homes for Wildcreek in Sparks that are $173 per sq ft for the 2451 sq ft home to $158 per sq ft for the 3176 sq ft home. I’m speculating that the cost of Estates at West Meadows homes may be more expensive due to the cost of land, abnormally high expense of removing and breaking up a huge amount of rocks in addition to moving high voltage power lines and utilities and drainage from the mountainside. Obviously, I don’t know how much more expensive but maybe pick 10% more cost per sq ft just for a guess. Hopefully, the cost of the homes will be available and published by the end of April. The next significant event is the opening of the D.R. Horton Sales Office on April 28th. At that time there should be literature available as well as pricing information and build out information. When i checked out the property a few days ago it was obvious that they are laying in more foundations for additional homes. I suspect that on April 28th they will have another 5-10 homes framed up to about the same state as the existing models homes. How do i know that? Simple, i walked up the development a couple streets and found several areas where they were preparing for cement slabs to be poured for new foundations. 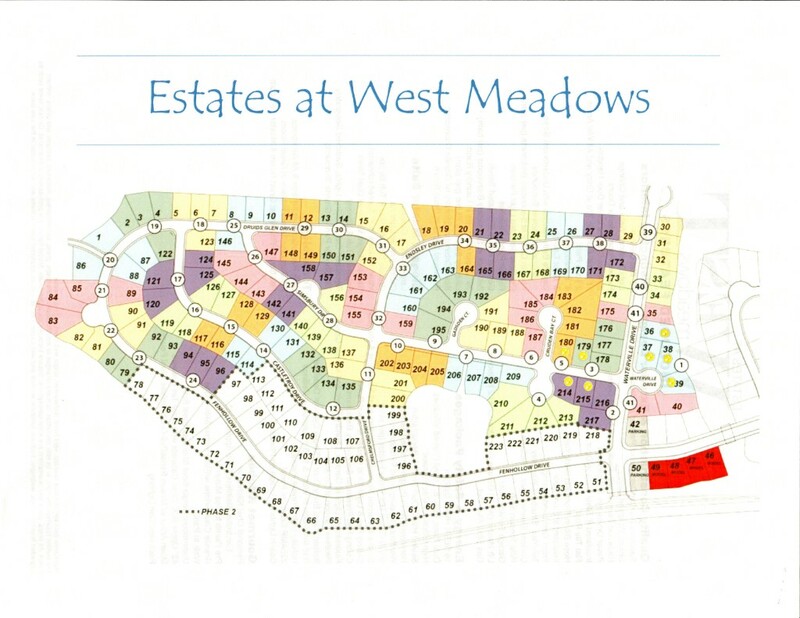 Floor plans for the single story homes in the Estates at West Meadows were covered in a previous post. There are 6 plans available for the Phase 1 homes. The plan numbers correspond to the square feet of the home, i.e., the 2700 Plan is 2700 sq ft. Call or email me if you have any questions about the development. They are starting out in Phase 1 which will have 269 single story homes and Phase 2 will follow with 55 two story homes – floor plans for the Phase 2 homes are not available yet. Click the following plans for details about the homes. Pricing is not available yet but will soon be published. D.R. Horton will also have a build schedule defining the order in which homes and models will be built. Typically, they build several homes at a time and then move on to the next group. I checked with D.R. Horton and they do not make any modifications to their floor plans except for some situations where they may modify a kitchen or bedroom layout. The sales trailer is targeted to open April 28th. If any of you that would like me to arrange a visit for you, on or after April 28th, drop me an email, text or call and I’ll set up a tour for you. Fill out the contact form below to get on a mailing list about events at The Estates at West Meadows or to indicate that you would like my assistance in purchasing a home and/or selling your existing home. Floor plans for the single story homes in the Estates at West Meadows are now available. There are 6 plans available for the Phase 1 homes. The plan numbers correspond to the square feet of the home, i.e., the 2700 Plan is 2700 sq ft. The sales trailer is now targeted to open April 28th. If any of you that would like me to arrange a visit for you, on or after April 28th, drop me an email, text or call and I’ll set up a visit for you. The building of model homes at The Estates at West Meadows has started. The photo below is the site of the first group of model homes and shows stakes and framing boards for the foundations. D.R. Horton’s intention is to open up the trailer as soon as the road to the trailer and a parking area is completed. I’m not sure how soon they can complete the road but it could be fairly soon – maybe a few weeks. After that they will start inviting potential buyers. Also, D.R. Horton is changing the name of this development to The Estates at West Meadows. D.R. Horton has also redefined the lot map for the development and defined the Phase 2 area for the 2 story homes within the dotted lines. The 325 home development will be in 2 phases. Phase 1 will have 270 single story homes of 1900 to 3000 sq ft. Phase 2 will be 2 story homes and have 55 homes for the Crest and Falls models – Crest will be (2400-2800 sq ft) and Falls (2400-3000 sq ft). No prices or floor plans have been published yet. I will send out as soon as I get them. My guess is that prices will start at low to mid $400’s up to mid $500’s for the larger homes. So far, there have not been any indications of home prices. I will continue to press the builder for prices and publish them as soon as I can along with information on models and floor plans. Posts and Framing Boards Being Installed. Preparation for concrete foundations – note pile of clean/screened soil (in back) and sand for installation/protection of utilities under the concrete (foreground). The sales trailer is shown to the left of the construction vehicle with tires. D.R. Horton Mobile Sales Office. The Office will open as soon as the road to the trailer and a parking lot are completed.